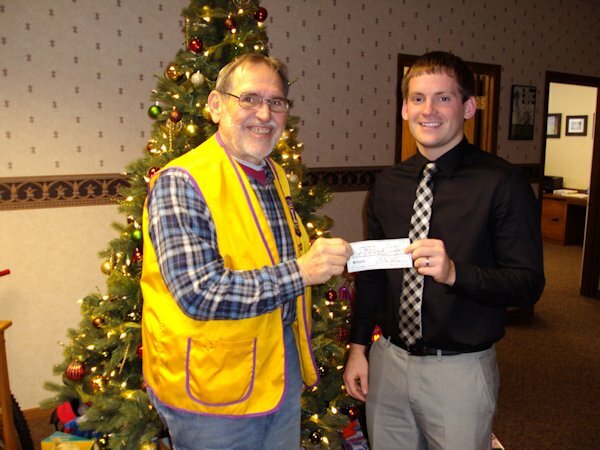 Jim King, President of the La Harpe Lions Club, is pictured presenting a check to Jacob Thomas, Loan Officer at First State Bank of Illinois, La Harpe Office, for the Christmas Gift Tree located in the lobby of the La Harpe Office. The "Community Gift Tree" project is in its 28th year of helping make Christmas a little brighter for families in the La Harpe Elementary School District. Monetary donations are used to purchase additional gifts. The La Harpe Lions Club has participated in this project for many years and encourages all in the La Harpe community to participate as well. New gifts and monetary donations may be left under the tree at First State anytime through December 12th.